Loved the Collision Industry Conference content in 2017? Bored out of your mind by it? Summit organizers want to know either way. 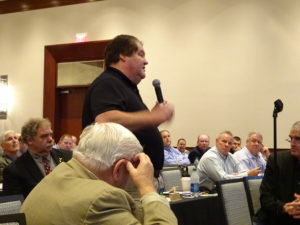 The CIC, which gathers auto body shops, auto insurers, vendors, OEMs and others together to discuss issues crossing their related industries, wants to know what attendees thought of its four 2017 sessions and what subjects they’d like to see covered in 2018. Take its quick survey here. Respondents to the 2016 version of this survey gave the body a pretty clear set of marching orders for the past four CIC meetings. Repair procedures and the repairability of new vehicle technology was deemed most important by 25.4 percent of those surveyed. The availability — or lack thereof — of technicians placed second at 18.4 percent, and insurer-repairer relations ranked third at 9.2 percent. Hot 2017 CIC topics included CCC Secure Share, the value and amount of training at auto body shops, OEM repair procedures and scanning. The body also approved an updated definition of a collision repairer in April after a year of controversy about earlier drafts of the concept. “We ran a similar survey at this time last year as we prepared for the bi-annual CIC Planning Meeting,” CIC Chairman Guy Bargnes said in a statement. “The results were both encouraging and insightful. The 2016 survey responses were used to shape the structure of CIC Committee activity and the content of CIC Meetings. “The current survey is designed as both a brief scorecard on how we did in 2017 and a request to those interested to list their current concerns which we will use to guide CIC action in the coming year. Take the survey here, and while you’re online, hurry and get tickets and reservations for next month’s CIC Week in Palm Springs, Calif.